It took me two trips, but my efforts have finally paid off. For those who have been following my blog, you will know that I visited Subway at Zion National Park in early October… only to find that a polarizer was absolutely mandatory. I had been putting off the purchase of a polarizer for my 150mm wide angle because of the 95mm thread size. It is a very expensive filter. After my first visit, I purchased said polarizer, then planned my return trip a month later. My second trip coincided with peak fall color. There really aren’t too many trees that one can incorporate into a composition at subway, but the spent leaves make for an interesting foreground. If you look carefully, you will also see the shapes of leaves resting on the bottom of the foreground pool of water. That detail should be quite nice in the final print. Just like my previous trip to Zion, this was also a trip of learning. However, this time, I was able to walk away with the shot I had in mind. Prior to the trip, I tried to obtain some Velvia 100 because of it’s good reciprocity characteristics. 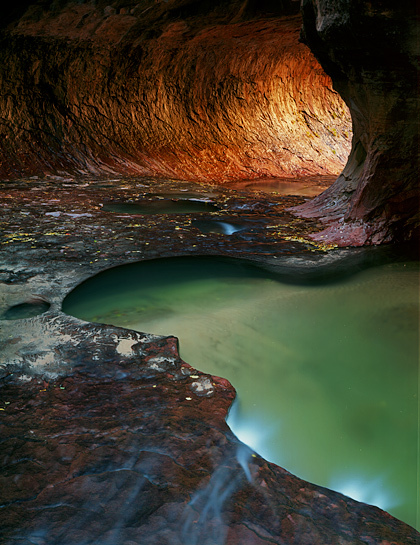 This means that the film will do well with the long exposures that are required in a slot canyon with reflected light. Unfortunately, that particular film was back ordered, so I ordered some velvia 50 (notoriously poor for long exposures) as well as provia, which does well with long exposures, but does not have the saturation and contrast of Velvia. I shot the same scene with both films, assuming that the Velvia 50 shot would be unusable, and that the provia would be the usable shot. Quite to my surprise, the Velvia shot turned out nearly perfect. It has a good exposure, good color, and I don’t see any color shifts or other issues. This is with a 15 minute exposure. The film is not recommended to be used beyond 1 minute. I was clearly stretching my luck, but it paid off. As is usually the case, there is usually a story behind a particular shot. This photo is no exception. I arrived in Zion on November 1st at about 11AM. The first thing I did was head to the visitor center to see if permits were available for subway the following day. There were still a few left, so I lucked out. The ranger told me that most of the permits had already been purchased. I knew that I would see many other people that day. I wanted to get a very early start the next morning to make sure that I was the first to arrive at Subway. This would give me plenty of time to setup my 8×10 camera, and hopefully get a shot or two off before the other people arrived. I enjoy the solitude of having a location to myself, especially when such long exposures are required. On my drive out to Zion, I felt like I was starting to come down with a cold or the flu, so I wanted to get the subway hike over with as soon as possible. It is definitely a physically intensive hike, even without carrying a lot of heavy camera equipment. As it turns out, I never did get sick, That can likely be attributed to the massive amount of sleep I would get each night. Since I was out there by myself on a solo trip, there was no sense in making a fire and sitting around after dark. I went to sleep not long after sunset each night. I started my hike up the Left Fork to Subway on November 2nd. My alarm went off at 4AM, and I was at the trail head by 4:45. It was well before sunrise, but I had the GPS tracks from my previous trip to guide me though the very disorienting first half mile of the trail. I would NOT suggest attempting a pre-dawn start unless you have done the hike before, and you have GPS tracks to follow. It is very easy to lose the trail. I descended the big cliff, then started my way up stream under a combination of moon light, and my headlamp. The hike is somewhere around 4 miles upstream, and can easily take 2 to 3 hours. There is no official trail, and plenty of stream crossings. As I approached my destination, the sun had already risen, and beautiful reflected light was already making its way into Subway. It was already perfect to shoot, though the light does get a bit stronger in the afternoon. I didn’t want to risk having a large group wander into my shot, so I quickly setup my photo, and took 2 photos with 2 different types of film. The shot at the start of this blog post is the second photo, taken on Velvia 50. On a side note, I found that my polarizer was much more effective in the morning than it was in the afternoon. In the morning, I was able to get rid of nearly 100% of the reflections. When I returned to take a similar shot in the afternoon when the background glow was stronger, I was not able to completely get rid of the reflection. A morning shot will yield a better foreground, but an afternoon shot will give a better background (slightly more glow). Below is a photo of my camera setup to give a sense as to what this location looks like to the eye. Velvia is a very saturated film, so it will enhance the color as well as the contrast. After shooting another pair of shots with a slightly different composition, I packed up my gear and headed to the second location that I was planning on shooting. There is a very well known “crack” about 100 yards south of Subway. Nearly all the water from the Left Fork is funneled through a narrow crack in the red sandstone. The water zig zags through the crack, and the surrounding sandstone is wet and glossy. In the fall, there is no shortage of leaves that get washed downstream. I removed a few leaves that were not very ideal looking. I am pretty sure that I photographed this location at the best time possible. The crack is located in the shade, but the sun was moving fast, and this location would have been in sunlight within the next few minutes. Since there is some bright sunlight just out of view, I picked up some beautiful reflected light just to the lower right of the stream. 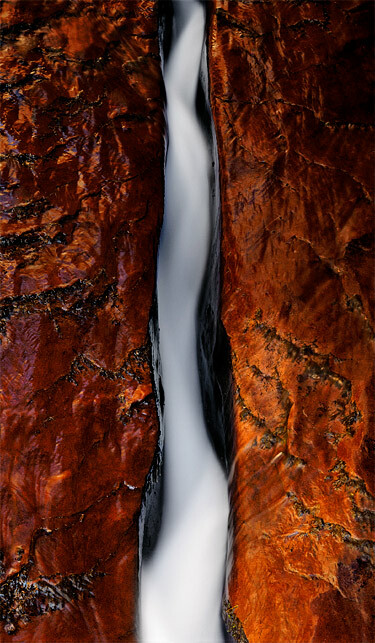 I was drawn to the zig zagging form of the water as it flows through the crack. I setup my camera to capture just that part. The lens that I was using (300mm 5.6) was a darn near perfect focal length for the shot. I’m glad I took it with me instead of the 450mm which would have been too long. I was able to use the front and rear movements on my 8×10 camera to my advantage for this shot. By tilting the front standard, I was able to get everything in focus. However, I was also able to tilt the rear standard (where the film is), which helped to give the impression that I am standing over the top of the crack. Essentially, I angled the back of the camera so that the top of this photo is enlarged. Since the top is stretched a bit, there is less perspective distortion, and it looks as though I am looking down. In reality, my camera is positioned at more of a foreshortened perspective. Here is an image of how I had my camera setup. Note the angles of the front and rear standards. The next photo shows the entire scene. Since all the rock is wet and slippery, it reflects a lot of light from the nearby cliffs. A polarizer is very important if you want to be able to see the deep red tones of the rock. Some photographers (including Fatali) have shot this purposely at a more shallow angle to feature the reflections. I was drawn to the color of the sandstone, so my goal was to minimize the reflection as much as possible. After shooting the crack, I headed back up to Subway. In the process I bumped into two people that I know. The first is Kurt, a photographer that I know through FredMiranda.com, and the second is a customer of the camera shop that I work at. Small world! Kurt mentioned that he had forgotten his headlamp, so he wanted to get an early start back to the trailhead. It was a long hike, but he had plenty of time to make it back. I setup one more shot at Subway to take advantage of the stronger glow in the background, then made two more exposures up there. When I was finishing up, I bumped into several photographers I know through FredMiranda.com. Bart Carrig, Robyn and Dave Fantle were all attempting the more ambitions top down route. It allows access to the upper region where Fatali captured his famous North Pole photograph. However, this route involves several rappels, as well as a swim through deep freezing water. That is something that I simply cannot do with my camera gear. My hats off to you guys for your adventure. Sorry about the tripod Dave. I’m sure that deep pool of water will take good care of it for you. By the time I had everything packed up, it was around 3PM. It is easy to lose track of time down in a canyon when you can’t track the progress of the sun. About half way back, the sun was starting to set. I could see the orange glow on the cliffs above me, and knew that I needed to pick up the pace. I was well prepared for a hike in the dark, but I wanted to make as much progress as I could. Bart mentioned to me that they might need a ride back to their car at the trailhead. Since the top down route is a one way hike, it is important to have two vehicles. One is left at the exit point, and the other is driven to the starting point. They had inadvertently locked the keys for the exit vehicle in the vehicle that was left at the trailhead — some 8 to 10 miles away. They were cold and much faster than me, so they went ahead. When I approached the final ascent (a very steep climb to a plateau several hundred feet above the creek), it was pitch black. There was no moon yet, so I had to rely on my headlamp. It took me about 15 minutes to climb the slope. I was taking my time. The footing is loose, and I wanted to avoid hurting myself. Nearly 2/3 of the way up the incline, I heard a voice from higher up on the trail. I removed my earphones, and listened. It was a familiar voice. As I climbed a bit further, I could understand better. “Ben, is that you?” Sure enough, it was Kurt. He was stranded at a very precarious part of the trail. He had injured his ankle, which had dramatically slowed his ascent up the steep slope. He was without a headlamp in the darkness. There was a narrow, rugged trail, and a steep drop-off somewhere ahead of him. As I approached, I saw that his ankle was in pretty bad shape. I was able to get him some Gatorade, then we slowly worked our way up the trail to the plateau. It is a difficult enough hike during full sunlight. I cannot imagine being in his position with a hurt ankle and no headlamp. Once we were up top, we had another half mile to go before we reached the trailhead. As I mentioned at the start of this post, that half mile stretch is very difficult in the dark. We hiked though the juniper grove for a short distance, then we were joined by Bart. After seeing that his group made it back to the parking lot, he was kind enough to head back out into the dark to make sure that Kurt and I found out way out though the maze. We made it back to the trailhead under partial moon light. By then it was likely around 7PM. Kurt was in good enough shape to drive back to the campground, I was able to give Bart a ride back to retrieve their other car, which had the keys for the vehicle at the exit point. It was a very long day. But we all were very fortunate to have such a great community of photographers at FredMiranda.com. I’m glad I was able to help out, and it was fun running into so many people that I know from that forum. It’s always nice to put a face to a name. If I had gone the entire day without having other photographers to talk with, the experience wouldn’t have been quite the same. Overall, I am quite happy with the shots I took that day. I was unsure of how the film would respond, and it was also quite difficult setting up some of the shots because the image on the ground glass was so dark. I learned a lot from the experience, and hope to visit Subway again next year. Now that I know the ideal times to shoot, I am considering conducting a workshop next year where I can guide other photographers of all skill levels to the right place at the right time. Subway isn’t too tricky, but the light dances around quite a bit in the Narrows. I’ll post more information about that workshop next year. This entry was posted on November 16, 2009 at 12:40 pm and is filed under Photography, Shooting Tips. You can follow any responses to this entry through the RSS 2.0 feed. You can leave a response, or trackback from your own site. I wanna know what music you were listening to? Glad to hear you got out OK. It was dark by the time I reached the trailhead, and I spent a few minutes having dinner at the trailhead. You guys were still in there when I finally left. Most of the time, I was listing to some podcasts. I get tired of listing to the same songs over and over again. I was playing a lot of songs from Brett Dennen on this trip though. I also enjoy listening to Coldplay when shooting in areas with slot canyons. I’m not sure why, but it seems fitting. I’m definitely heading back again next year. I have some more ideas on how I want to shoot that area. Ben, I really enjoyed this post and the video was a nice addition. I was there last November about a week after you, with a buddy from Dallas. We missed the peak colors, plus we got a much later start in the day than you. Learned a lot from our mistakes (primarily the late start) and from your post, so I’m hoping to nail it on the next trip. Thanks for posting this; it’s great to have it as a reference. I’ll keep an eye out for you on my next trip. One last thing…can you say a bit about how you shot the video? Hi, great to hear from you! I plan on returning to Zion during the first week of November again this year. I feel I have so much unresolved business there. There is always that fleeting shot where all the elements seem like they make for a good photo, but I just couldn’t quite find the shot I wanted to shoot. I might even head back to Subway during my next trip in May. I’m hoping to try out some color pint film since I wasn’t 100% happy with the shot I took there. The video was shot with my little powershot elpth SD780. It does 720 HD video, which is great for this sort of thing. Plus, I love how small the camera is! Ben, a quick follow up question… The videos are a very nice addition to your blog postings. I’ve watched quite a few of them now, and I noticed they all look very steady, unlike most hand held video from small cameras. Just wondering how you mount your elph SD780 to get the steady shots? Thanks for all your feedback. And for the great posts. Really enjoyed the series you did on your Colorado Plateau trip this year. It’s all very good stuff. Thanks Ron. Most of the videos are handheld but I am careful to try and keep them steady. I do have a few other tools I use though. In the Zion video, I mounted the camera to a tripod that was mounted to my pack when I was hiking. I also have a Tamrac Zipshot tripod which is made of tent poles. I use that for shots when the camera needs to be stationary. However, I will also use it as a monopod (I just tie the legs together) to hold the camera out away from me. I used this technique for several videos during the Colorado Plateau trip. Finally, I have a suction cup mount which is great for attaching to the windshield of my truck, or in some cases the outside of my truck. The 780 proved to be a great camera for this stuff, but I really have my eye on the new SD4000. That camera will refocus, and optically zoom during video. The 780 does neither. The videos give me something else to do while I’m out there — plus, they’re fun to do. I started doing them so I could remember the settings I used, and when I shot particular photos since I have no EXIF data with LF. I’m glad you enjoy them. On the topic of Zion, I’ll be there again this year October 31 through November 10th. I’ll do the subway hike very early in the trip since fall color hits the higher elevation sooner. I also have some shots back in the Narrows that eluded me last year. We may very well run into each other on the trail. I’ve just become a huge fan of this blog! I’m learning photography (baby steps) and I love how you tell a backstory about how the shots were taken. I’m in San Diego too, so will look for your next exhibit so I can see your photos in person. Thanks Laura! I checked out your flickr account, and see that you’ve got some great shots from some awesome places (coyote buttes north/south, etc). Very cool stuff! Thanks for tuning in to my blog. I hope to have some cool new content on my blog in the coming month or so — lots of video and other fun trip related stuff. Thank you!! Looking forward to the new ones. I’ll be going to Utah two more times this year, and you’ve given me plenty of inspiration! Where do you post your workshops? If you do one in Zion, I will be there! !